This information was first made available to the magic fraternity by W. G. Magnuson and Joseph Ovette during the 20s. Over the years, these techniques have been mostly forgotten. 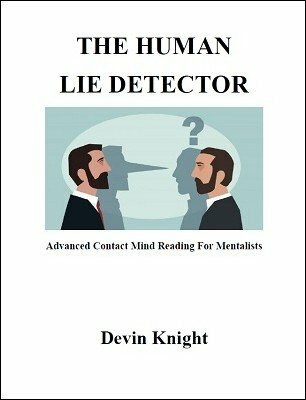 With this technique a mentalist, medium or psychic can determine roughly 90% of the time if a person is lying through contact mindreading. You will find that this technique will work with the average person you meet. The person doesn't have to be a Pinocchio and have their nose grow. It just works. At some spiritualist summer camps, phony mediums will use this technique to question a sitter's spouse about their fidelity in front of the other person. The medium claims through their psychic ability, they can tell if the person is telling the truth or lying. I know in the past, I have questioned some of my girlfriends using this technique and gotten to the truth. You might say this technique gave me an unfair advantage. You can use it on your spouse too, if you so desire. This is the real work on how to do this. It is easy to do and should be in the arsenal of any magician, mentalist, or psychic.